Read this paper to learn how the ENERGY STAR program works with the automobile manufacturing industry to improve energy performance through benchmarking. The Energy Performance Indicator (EPI) developed for motor vehicle plants estimates the range of energy performance across the entire industry. The results of the industry's efforts to improve energy efficiency are included. Read these Frequently Asked Questions to learn more about EPA’s 2014 ENERGY STAR® National Building Competition. This four-page document provides information on recognition opportunities, eligibility, team formation, ENERGY STAR Portfolio Manager®, and benchmarking and improving water efficiency. Read the rules for EPA’s 2014 ENERGY STAR® National Building Competition. For the first time ever, the annual competition recognized teams for energy and water saving achievements. 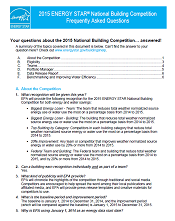 Fill out this spreadsheet if you are planning to compete in EPA's 2015 ENERGY STAR National Building Competition as part of a team. You'll need to submit a team name, contact information for the team lead, and the Portfolio Manager building ID number for each participating building. Use these instructions to submit building energy and water data to register for the 2015 EPA National Building Competition. Use this blast email template to create a customized message to send to your building tenants, colleagues, or stakeholders to let them know about EPA's 2015 ENERGY STAR National Building Competition and how they can help. Read these Frequently Asked Questions (FAQs) to learn more about EPA's 2015 ENERGY STAR National Building Competition. This seven-page document provides information on recognition opportunities, eligibility, teams, ENERGY STAR Portfolio Manager, the Data Release Report, and benchmarking and improving water efficiency. Use this two-page document of ideas to celebrate your participation in EPA's 2015 ENERGY STAR National Building Competition and your involvement and commitment to saving energy with your colleagues, employees, customers, and community! You can find great ideas for engagement, such as reserving a special parking space for your green team captain, or hosting a pep rally to kick-off the competition. Use this customizable newsletter article to promote your participation in EPA's 2015 ENERGY STAR National Building Competition. Add your organization details and include the article in your next regular newsletter or email to tenants, occupants, and other stakeholders. Use this PowerPoint template to create the perfect presentation for all your stakeholders in EPA's 2015 ENERGY STAR National Building Competition. Add your personal touch by including pictures and descriptions of your competing buildings, or even background on your team and mission!